Shots can be a major cause of stress for babies (and their parents) in their first year of life. But they don't have to be painful, says Stefan Friedrichsdorf, MD, medical director of the Department of Pain Medicine, Palliative Care, and Integrative Medicine at Children's Hospitals and Clinics of Minnesota: "We know exactly what to do to significantly decrease pain caused by vaccination." He notes that an estimated 25% of U.S. adults are afraid of needles, a problem that often starts with negative childhood experiences. He believes some families skip helpful immunizations or other procedures because they hate to see their baby's discomfort. Friedrichsdorf is out to change that. Children's Minnesota now ensures that all children have a four-step pain-relief routine any time they need a shot or blood draw. Apply a numbing cream that contains 4% lidocaine to the area where the needle will be inserted (usually the upper thigh). You can get this inexpensive cream without a prescription, but you must apply it 30 minutes before your baby gets the shots. "That means you have to plan ahead," Friedrichsdorf says. At his hospital, the cream is applied soon after babies are checked in for their appointment, then the area is covered with a piece of foam tape to keep it out of reach until shot time. (A piece of plastic wrap laid on the cream also works, Friedrichsdorf says.) Instead of the cream, the American Academy of Pediatrics suggests a spritz of cooling spray on the skin. Some hospitals use a small buzzy device that combines cold with vibration. It's placed on the skin next to where the baby will get the shot, which blocks pain sensations. Research suggests that sweet flavors cause the brain to release feel-good brain chemicals. Because breast milk is sweet, breastfeeding moms should nurse during shots. But if you're bottle-feeding or a dad, Friedrichsdorf recommends dipping the baby's pacifier in a 24% sugar-water solution available at the doctor's office or placing a drop of the solution on the baby's tongue right before the shots. "Never, ever, ever, ever hold a child down" for a shot, Friedrichsdorf says. This can trigger anxiety and a long-term fear of needles. If you're not nursing your baby, swaddle her, leaving one leg out for the shots. If your baby is 6 months or older and can sit up, hold her. Get your baby's attention by making soothing sounds or showing her an interesting toy. At Friedrichsdorf's hospital, medical teams use hand-held fan toys with lights. "Babies are totally transfixed," he says. As she grows, options might include bubbles, pinwheels, or books. This pain-relief routine may be new to your child's doctor. Friedrichsdorf offers these tips for talking with your pediatrician. Ask for all four steps. Your provider may agree to use just one or two of the steps of this routine. But Friedrichsdorf recommends using all four steps to protect against needle-poke pain. Bring your own numbing cream. You can get 4 percent lidocaine cream without a prescription at most drugstores. Bring a tube in case the doctor's office doesn't keep it on hand, and tell your provider you want to use it. Don't romanticize pain. 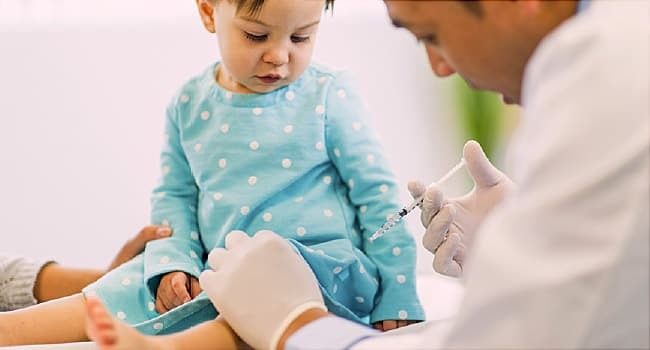 Some parents and providers hold old-fashioned beliefs that children will be "wimpy" if spared pain from shots or blood draws. Friedrichsdorf strongly disagrees. "Pain does not build character," he says. Stand up. Medical practices can be slow to change routines, Friedrichsdorf says, so you may need to insist on pain control for your infant. "You may get pushback, but do not fret," he says. "Stand up for your child." Stefan Friedrichsdorf, MD, medical director, Department of Pain Medicine, Palliative Care, and Integrative Medicine, Children's Hospitals and Clinics of Minnesota. News release, Pain Reports, Wolters Kluwer Health. The Royal Children's Hospital Melbourne: "Sucrose (oral) for procedural pain management." CHEO and Ottawa Public Health: "Be Sweet to Babies."